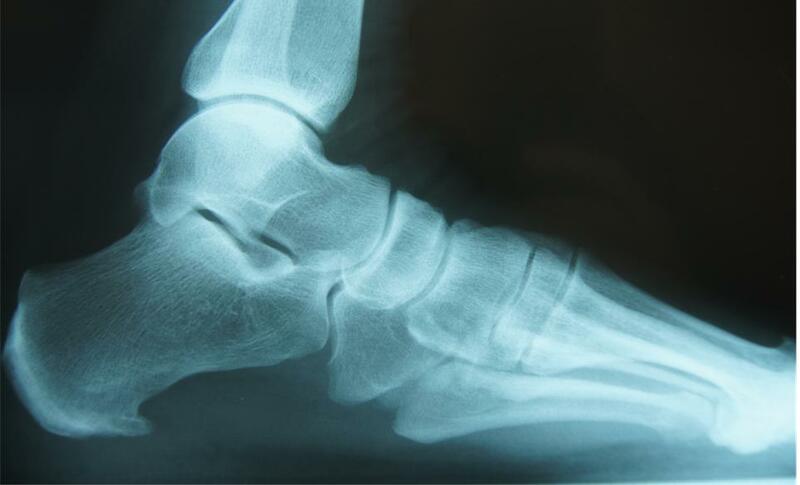 A Calcaneal spur or heel spur is a calcium deposit causing a bony protrusion (osteophyte) on your heel bone (calcaneus). It is typically detected in a radiological examination (X-ray). 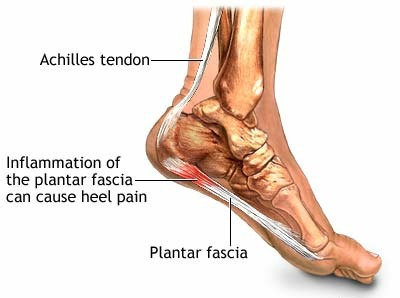 Heel spurs are often caused by strains on the foot muscles and ligaments, inflammation of the plantar fascia (the bow-string like tissue stretching from the heel underneath the sole to the ball of the foot) called plantar fasciitis, and repeated tearing of the membrane that covers the heel bone – a process that usually occurs over a period of many months. Heel spurs are especially common among athletes whose activities include large amounts of running and jumping especially over the hard surfaces, obese people, flat-footed people and people who have high arched feet or who often wear high-heeled shoes. Increasing age – which decreases the plantar fascia flexibility and thins the heel’s protective fat pad, diabetes, poorly fitted or badly worn shoes – especially those lacking appropriate arch support, spending most of the day on one’s feet, and frequent short bursts of physical activity can also put one under high risk for heel spurs. They can occur at the back or underside of the heel bone around the ligaments and tendons of the foot, where they are attached to the bone. A posterior calcaneal spur develops at the back of heel and is associated with inflammation of the Achilles tendon – Achilles tendinitis. It typically causes tenderness and pain at the back of the heel made worse by pushing of the ball of the foot. An inferior calcaneal spur develops under the sole and is associated with inflammation of the plantar fascia but may also be associated with ankylosing spondylitis esp in children. This causes localised tenderness and pain made worse by stepping down on the heel, is worse in the morning on first stepping your heel on the floor and also increases on walking. You may not be able to bear weight on the afflicted heel comfortably. Running, walking, or lifting heavy weight may exacerbate the pain. 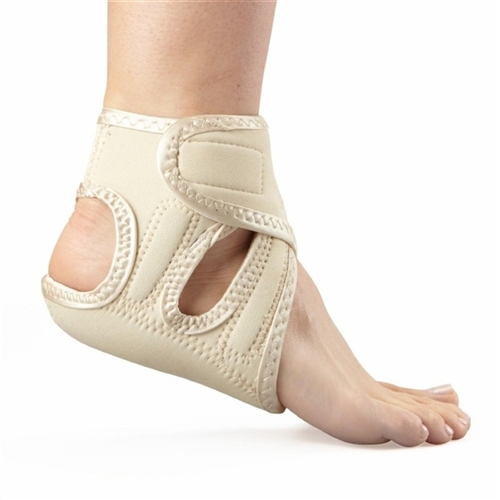 To decrease inflammation and swelling at the site of the spur and avoid injury. Anti inflammatory drugs or cortisone injections are also used. 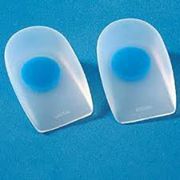 Heel lifts reduce stress on the Achilles tendon thus relieving pain at the back of heels. “Donut” shaped shoe inserts take pressure off plantar spurs. If it’s very large it may require surgical removal. Homoeopathy offers effective and permanent cure by taking care of the deranged metabolism. Medicine like Calcarea Fluor, Ammonium Mur, Ruta, Aranea, Rhus Tox, Aurum Met and Mezereum to name a few, work specifically on the heel to reduce inflammation of the bony tissue and tendons, prevent further enlargement of the spur and even its eventual dissolution in some cases if given in early stages. Though radiological cure may not be possible in all cases still homoeopathy is a highly recommended line of treatment. So if you suffer from recurrent heel pain, do not ignore it and see your homoeopath at once. Posted on February 15, 2016 June 1, 2017 by Dr. Renu MadanTagged Calcaneal spur, heel pain, heel spur, spur. Next Next post: Am I Sitting on a bomb? I’m suffering from acute pain in left heel no medicine is working difficult to walk. Your information is very valuable for me. We are glad that it could be of some help to you. Do let us know in case you require any other assistance. Tx. Dr Renu, I have been advised Rhus Tox 30, 4 times a day from today. Let’s see the result. Oh, that’s great! It’s one of the best remedies for pain due to calcaneal spurs. Take it religiously for a couple of weeks at least. Thanks and so nice of you. All the blessings to you to flourish in your life in all spans. I am 65 years, hence blessed you for all your courtesy and positive responsiveness which is generally lacking amongst us Indians. It has been diagnosed as plantar fascia by the orthopedic but did not recommend X-ray. Will I be able to walk and run freely in future. How much time it w’d take to heal completely? I have been advised 3 excercises which I am not able to do dedicatedly because of pain or fear of increase in pain. In addition to the medicines, its important to do the recommended exercises. Cold compresses are very useful. Please inform where heel seat wrap is available, I have seen it after reading your reply after the text of “Treatment”. Best wishes. Renu, excellent way of writing. Medical language made easy even for a layman.